Heat oven to 325 degrees F. Coat a cookie sheet with cooking spray. In a large mixing bowl, whisk together flour, cocoa powder, graham cracker crumbs, sugar, baking powder and salt. In an additional large mixing bowl, whisk together butter, marshmallow cream, egg and vanilla until well combined; stir in dry ingredients until a stiff dough forms. Stir in milk chocolate until combined. Dump dough onto cookie sheet and form two (about 5 inches in length) logs. Bake 30 minutes. Remove cookie sheet from oven and cool 30 minutes. Reduce oven temperature to 300 degrees F.
Transfer logs to a cutting board and diagonally cut into (1/2 inch thick) slices. Place on cookie sheet; bake 10 minutes, flip, and bake an additional 10 minutes. Transfer to wire racks to cool. Melt white chocolate in a small bowl in the microwave for 1 minute, stirring every 20 seconds until melted. Dip sides of biscotti in white chocolate, followed by graham cracker crumbs. 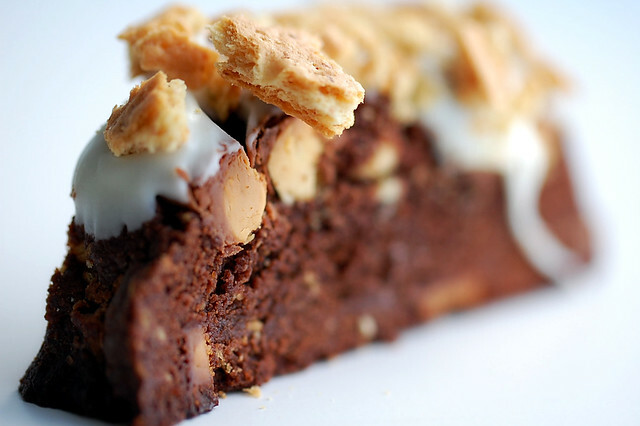 46 comments on "S'mores Biscotti"
Keeping you and your family in my thoughts! These look delicious. Going camping this weekend. S'mores are on the menu! You asked on Chocolate With Francois what my favorite madeleine was? I've only made them once, Chesnut Honey Madeleines.http://littlebitofeverythingne.blogspot.com/2010/06/chestnut-honey-madeleines-sms.html. Do you have a favorite? My thoughts and prayers will always be there - hang in there. On a brighter note, I'm loving this rendition of traditional biscotti! This is genius, Emily - and looks delicious! I did not know about your brother in law, I'm so, so sorry... Let's hope and pray for him. Continued prayers for you and your family for positive news. I think your blog is special because of your personal stories, I can't imagine it any other way. Take care. My mom is going to truly love you when I make this recipe for her. She is a die-hard biscotti fan..and obviously a choco-holic! Helloooo biscotti! 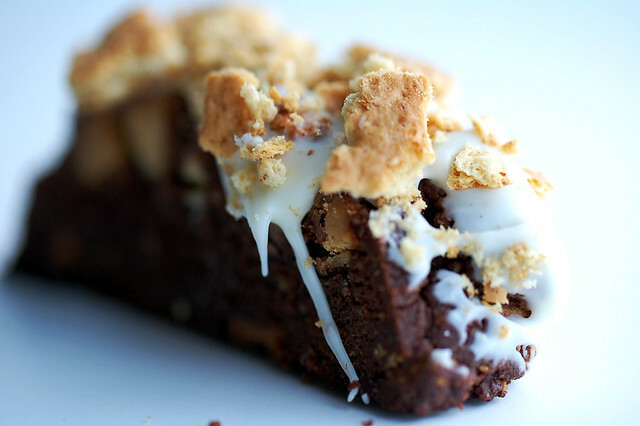 Love love LOVE the white chocolate and graham cracker topping idea...delish! That looks so good! I've always wanted to make biscotti. I think you have pretty much got the "foodporn" element covered in this post!!! Amazing!! Oh my word. I've made biscotti before but why have I never thought to make a s'mores biscotti? You've inspired me. I'm definitely saving this recipe. Yum, biscotti gone s'mores! I doubt you missed much at cake class. You can teach most of what you learn there to yourself! Hopefully, all the news will be good! You're quite ingenious to dip the biscotti in graham cracker crumbs. Last night on Cupcake Wars (I think it was a repeat), one of the bakers did that. She had icing on her cupcakes, graham cracker crumbs and then something else on top, which I can't remember. Are graham cracker crumbs the new grey? You're a lovely person and i read every one of your blogs. The recipes are DELICIOUS and CREATIVE! Your biscotti look lovely and I'm glad to hear that Mike is stable. Stay positive and I will continue to pray for you, your family and a speedy recovery for Mike. I found your blog while looking for SunButter recipes, when you mentioned sunflower nut butter. I've kept following because of your innovative takes on traditional recipes--and your beautiful photos. As a SunButter blogger, I enjoy your fresh take on baking. As a fellow baker, I appreciate your perspective and yummy recipe ideas. Thanks for another great post! oh wow these looks sinfully good!! here's to five more pounds...what the heck! I hope things are getting a little better everyday for you and your family! stay strong and remember we are all praying for him and your family! Thinking of you and your family. Hugs. And PS. I never get excited about biscotti, but anything that involves s'mores... oh my, you've made me excited about biscotti! I was totally thinking about making biscotti today, but I made pumpkin brownies instead. Anyway, I'm glad I didn't, because now I just HAVE to make these. How is everything you make so delicious looking!? They look totally yummy! And hey, I think a lot of us post things in our personal life because it is an outlet for us. We can't always tell a loved one something they don't want to hear, or we can only be strong for so long until we feel the need to cry, break, or break things. It makes us all human, and makes us who we are. Hope Mike pulls through and gets better. I'll send a prayer his way. You are a genius! I think you may have a sellable item here! I'm glad to hear your brother-in-law is stable. I will definitely keep you and your family in my thoughts. Your baked goods always look so yummy, but I like reading the about the little bits of your life that you include in your posts! It keeps it interesting. Hope the end of the week is filled with good news for your family. Sending you positive vibes and keeping my fingers crossed for you. I will keep your family in my prayers. The biscotti looks delicious...love S'mores! I love when people also write about themselves in their blogs and not just recipes. It nice to know a little about the cook too!!! Glad to hear that Mike is stable. These look amazing!!! 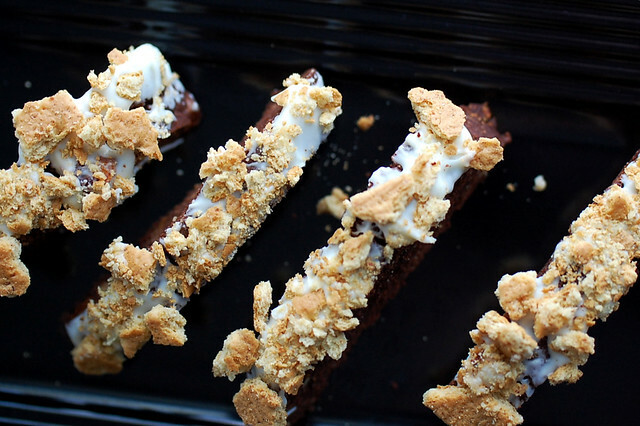 S'mores biscotti - now that is something I'd travel for. Keep us posted on Mike. And no, you don't get too personal on your blog. I enjoy getting to know other bloggers through their writing. Biscotti is my new favorite cookie. I think I've said that before but I'll say it again. And this one looks exceptionally good. girl never feel bad about saying what is going on in your life. that plus more prayers help... so tell us all so we can help!!! on the food note this biscotti has my mind going stir crazy to leave work and make them! YUM!!! 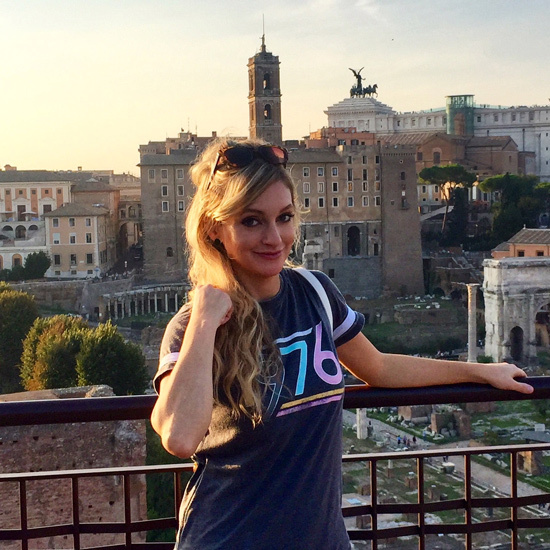 Take a few days off from blogging and you miss so much. I was so sorry to hear about Mike. Prayers and big hugs to everyone. Baking can be your solace. I'm sorry to hear about your brother in law, I hope he recovers quickly and fully. I'm finally catching up on blogs...will be praying for your fam! Hope you hear more good news! These look amazing. I'd love to try one with a nice hot cup of tea! So sorry to hear this, Emily. I'll keep your brother in law in my thoughts. i hope mike gets up soon enough! ...never had a biscotti before but i'm sure these must have tasted fantastic. i have always got a thing for s'mores. Good decision with the class, you'll learn more off Youtube! so glad things are looking up! 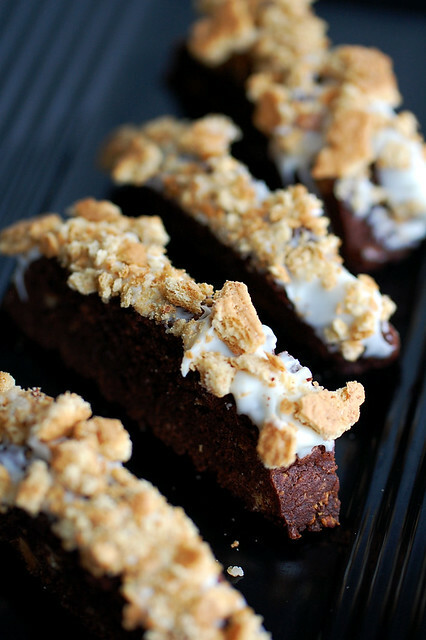 and speaking of up, what about my weight after i'd have to eat MANY of these smores biscotti!!! oh man, they look good! Your pictures in this post are insane. I LOVE them! and just so you know, I tried out the S'mores Biscotti recipe today, and Omg, delicious and so easy to make!! Thanks for sharing it! My thoughts are with you and your family. I hope he is doing better! Kaffy! Yay! That makes me happy! Glad you liked them.